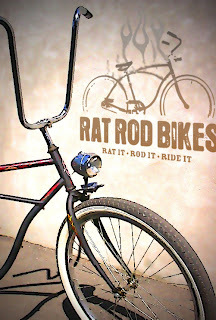 As of this Saturday sept 15th 2007, the build off at ratrodbikes.com has officially started. You can follow all the action, the drama, the sweat and tears as rat rod bikers duke it out in an all out battle to the end... Oops! Got carried away a bit, hehehe. The second build off at ratrodbikes was much anticipated by many, partly because the membership at the forum as grown a lot since the first one. Rat Bikers also love to build bikes and show off in a very friendly manner. The build off is the perfect occasion for builders to not only show off their talents, but also to share ideas and find new ones. With almost 400 new members since the last build off, this should be very interesting. I cannot wait to see what new ideas will come out. The rules specify that the frame cannot be modified with welding equipment, this is to keep the playing field level for those who do not weld. Last build off I showed up late and it was in the middle of winter. My entry ended up being a DNF for lack of nice weather, time and parts. NOT THIS TIME! I have the perfect subject, most of the parts I have or are easy to get and I have a vision! Vision and inspiration are two essential ingredients for this type of endeavor. My entry 1950 CCM "Victoria"
Vintage 1950 CCM Ladies Bicycle, mine...all mine!